Da Nang Travel Guide: Experience Da Nang and Beyond! Discover the areas in Da Nang that you should explore, and also the cities nearby. 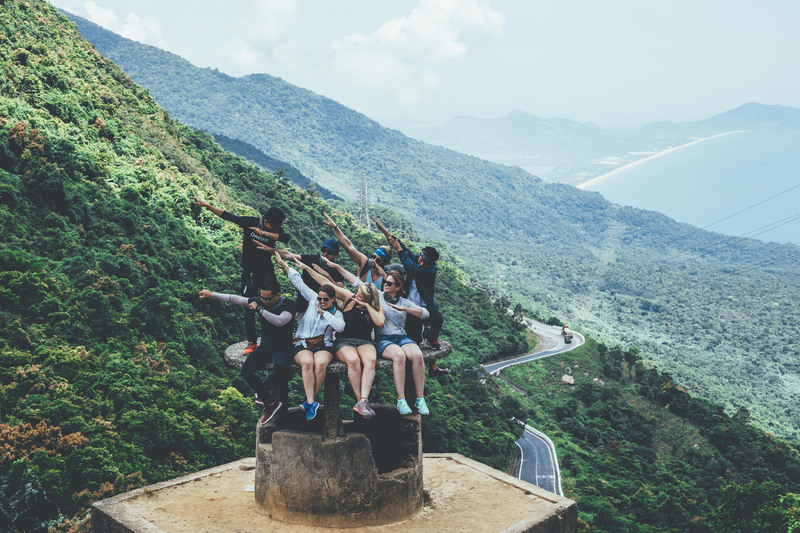 Da Nang is more than just a coastal city with beaches – it has mountains, amazing hiking trails, historical sites, and little quirks in the city to enjoy. While the city itself harbors many incredible opportunities, the surrounding areas are also rife with adventure. Here is our comprehensive Da Nang travel guide, make sure to click the links included for further details! Da Nang is conveniently located in central Vietnam with close proximity to the mountains, and long stretches of beaches on either side of the city. The city itself is a colorful burst of energy between its fast modernization and charms of the old town. It is somewhat spread out between the east and west side of the river, and the north and south beaches. You will find the typical close-together grid of streets on the west side, with tons of eating options, nightlife, and shopping. New buildings are completed every day so the options seem endless. The expat community is taking root near the south beaches with many Western food options in the An Thuong area. Once you make your way out of its radius, you will find endless seafood restaurants lining the beach. Da Nang food is by no means as extensive as that of Hanoi and Ho Chi Minh City but it has its own central cuisine. Try my favorite, mi quang, on a hot day, or the Vietnamese pancake, banh xeo. As I mentioned above Da Nang has many good seafood options. The seafood is often displayed still alive in big shallow buckets on one side of the restaurant. Try grilled ray fish. It is often served with rice paper so you can make a fresh roll combined with herbs and a special sauce. Grilled oysters and seafood hotpot is also among some of my favorite foods to eat in Da Nang. Keep in mind that the seafood is seasonal, so prices will fluctuate depending on how readily available the seafood is. Da Nang is unique because although it is a big city, it still sits between many day adventures and the airport makes for easy and quick travel between cities. Da Nang was also an important site during the war and there are still many reminders of this time period both in and around the city that are worth checking out. The best way to explore this is to take your motorbike up the old military roads on Son Tra peninsula after stepping foot into the war museum which explains some of the war sites around the Da Nang area. Like most cities in this area, the best time to visit Da Nang is from February to May when the air is cool but there is little rain. The rainy season is from October to January and it makes it hard to experience all Da Nang has to offer. The months of May to August are also very hot, the ocean being the only way to cool off as the humidity strikes. First, I will tell you about half-day trips you can accomplish with Da Nang as your launching pad. These areas are just outside the city and you can either take your own motorbike there or hop on a bus. Son Tra peninsula is my favorite part of Da Nang. The foot of the peninsula is only 16 kilometers from the city center. I recommend renting your own motorbike for the day and exploring the steep and scenic military roads that were left over from the war. If your motorbike has a small engine, enter from the port side of the city instead of heading straight for the Lady Buddha that protects the local fisherman. Google Maps gives you a good idea as to the extent of these fun roads and their steep grades. You can find hidden beaches, small hikes, a statue of Confucius, and an 800-year old tree among other things on this peninsula. My favorite way to enjoy the surrounding beaches is to purchase a snorkeling mask and snorkel at the local fishing street. Stick to your bargains with the ladies on this street, they drive a tough price. Snorkel in hand, motorbike around the peninsula looking for offshoot roads down to the water. These are pretty hard to find but one of my favorites is the Black Stone beach. Many locals come here, especially on Sunday to enjoy their day off and eat seafood. This mountain wonderland of amusement parks, incredible views, cable cars, and European villages is 35 kilometers to the southeast of Da Nang. Originally built by the French in 1919, this area was established as a getaway destination since it experiences much cooler temperatures than its surrounding environment. It is now home to a world record, known for its longest non-stop cable car and the growing-in-fame Golden Bridge. While it does not afford the freedom of exploration that is characteristic of Son Tra peninsula, Ba Na Hills does offer a different charm. If you want to get away and far above the world, buy the 700,000 VND ticket which includes a two-way cable car pass and games in the Fantasy Park area. This area is great for families and for travelers wanting to explore the famous Sun World amusement parks that Vietnam is famous for. If you are looking for more off-the-beaten-track adventure, this is not for you, but do not fret, I have covered a few more adventures for you below. To learn more about Ba Na Hills, please read our guide here. You can’t visit Da Nang without seeing the Marble Mountains. Located to the south of the city, this area is home to a lot of history, and you guessed it, marble. Once you climb the many stairs, you’ll gain access to the series of caves and shrines, partly spooky, partly beautiful, this is a completely unique area. You can easily see this entire place in half a day and leave to be on your merry way to Hoi An. By far my favorite part of this mountain complex is not actually above the clouds, it’s below the earth. Buy a separate ticket to venture into the “hell” below the mountain. Walk through different scenes and sins, there are small plaster figures even in the smallest of nooks. If this sounds interesting and you don’t mind sweating in the heat as you climb up and up, then read about the spots you not should miss while exploring this site. The following places can definitely be explored within one day, but if you do have more time, I always suggest spending more time in every city of Vietnam. Hoi An is a convenient 30 kilometers from the Da Nang city center and it offers a different experience. 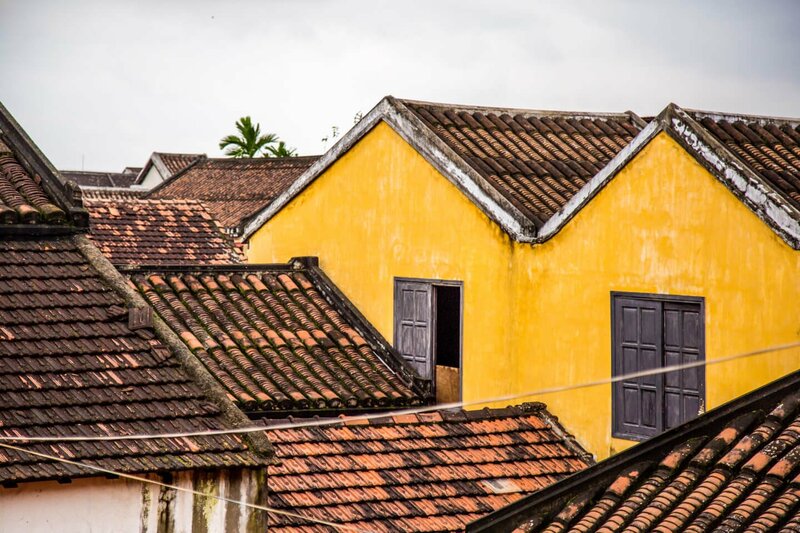 If you would like to see the French architectural influence that permeates Vietnam, then this is the place for you (check out our article about transportation from Da Nang to Hoi An here). The old town is filled with shops, crumbling yellow buildings, intricate temples, and vibrant lanterns. Every night, paper lanterns are passed from boat, to hand, to water. You can sit next to the river as the lanterns float by, enjoying a bowl of Cao Lau for just 15,000 VND. There are also many wonderful beaches with inviting chairs. Unlike Da Nang, you can purchase a drink and take advantage of the shade and a nice chair all day. An Bang beach is my favorite, and it has many nice seafood restaurants. If you continue walking along the beach, farther away from the main road that services the beach, Hai Bai Trung, the seafood prices become cheaper. 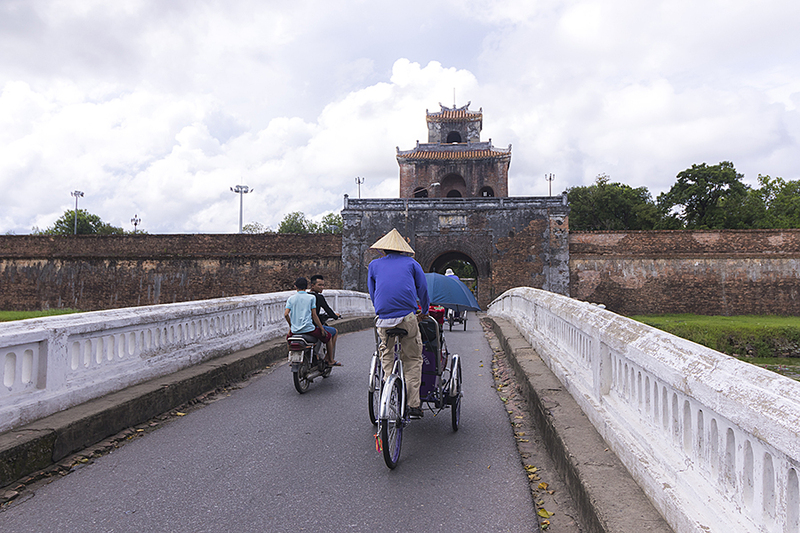 I like making a day trip or weekend trip to Hoi An during the low season when there are not many tourists because you can enjoy the town to yourself. The rainy season, or low season, is from October to February and the dry season, which sees more tourists, is from March until September. There are also many wonderful accommodations in Hoi An, including Christina’s Hoi An that is a little bit outside the town center, and right in the heart of Tra Que Vegetable Village, which makes for a quiet and relaxing stay. The My Son Sanctuary is only 40 kilometers from Da Nang and it is well worth a visit. 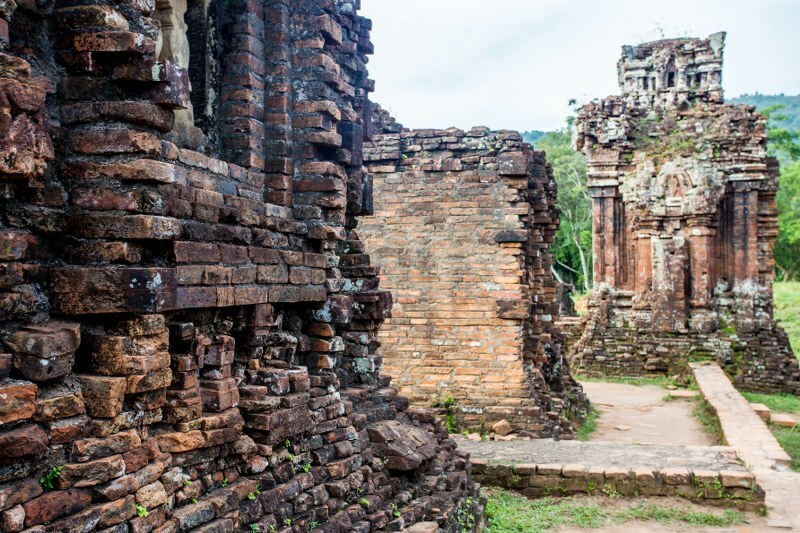 It was made a UNESCO World Heritage site in 1999 and it is home to the Hindu ruins of what was once the grand spiritual and political grounds of the Champa Kingdom. There are 71 different monuments that were built between the 4th and 13th centuries and restored in the 19th century by the French. There are only around 20 standing structures in decent condition now, some of which have been heavily restored. A lot of the structures were destroyed during the Vietnamese War, and the humidity and climate are also slowly contributing to the deterioration of the complexes. You can still see evidence of several bomb craters and bullet holes that contrast with the regal brick structures. One entire tower grouping was destroyed by American bombs. Nestled in Quang Nam province in the mountains that loom high above the ruins, My Son is truly stunning. The brick structures and towers seem organically fused with the green of the grass that has slowly overtaken some of the crumbled buildings. You might even notice that these buildings were built in three parts: the earth, the realm, and heaven. Wander through the different sites, up the steep stairs and into the cool alcove of the towers. Touch the intricate stone carvings and think of the Hindu god, Shiva. Notice Hon Quap, “Cat’s Tooth Mountain,” that seems to protect the grounds high in the sky. A few of the structures are home to found religious items and even a few leftover war pieces but the true beauty lies in the unique architecture of the towers. What many people miss are the scattered sites outside the main My Son temple complex such as Dong Duong, Bang An, Chien Dan, and Khuong My. Many of these towers are hidden in the fray, alongside the road, and they usually require no ticket to view. I recommend making the day trip from Da Nang to the My Son complex, adventuring to the small sites outside the complex, and then finishing your afternoon on the An Bang beach in Hoi An. Hai Van pass is farther away from the city center than Son Tra but it arguably provides better views. It takes about 40 minutes to get to the foot of the pass but that’s where the fun starts. Take your motorbike up the steep roads as Da Nang slowly stretches below. My favorite way to experience Hai Van pass is to catch the sunrise at the very top. There is a small road you can take beside the gateways that leads to the top of the mountain. There are a few buildings but one long wall stretches from either side, and it’s a nice place to sit as the sun rises over the hills and water. Spend a little time wandering around the relics built in 1826 by Emperor Minh Mang after you travel back down from viewing the sunset. This complex was constructed as a means of defense back when Hue was still the capital. There are also a few military bunkers at the very top. On the other side of Hai Van pass is a strip of beach that is worth a stop. This town is called Lang Co. If you need lunch, stop and grab a fresh plate of seafood or simply enjoy a café sua on the calming beach. There is also a beautiful cemetery that stretches below the mountains of Hai Van pass; the astounding colors of the tombstones ripple in the heat against the green landscape. Central Vietnam has so many gems to explore, the following three are just a few. These areas can definitely be explored within a long weekend. Hue is 100 kilometers from the Da Nang city center but it can still be easily done in a day’s time. Da Nang and Hue both offer a completely different experience which is why it is worth a visit to both. Hue has many beautiful historical monuments such as the 19-century citadel and the many tombs but it is quiet and less lively at night. It is also situated on the Perfume River, a wide and calming expanse of water. Hue was the capital of Vietnam until the country was divided during the war. Between the Perfume River, its regal monuments, and calm demeanor, Hue has a quiet dignity that makes it a wonderful place to visit. You can see the Imperial City and tombs in one day but it does require quite a bit of driving around the city. Hue also offers a few destinations off the beaten track if you feel you’ve had enough of tombs and pagodas. Not far from the city center is an abandoned water park, Thuy Tien Lake. It has been abandoned since around 2004 and now remains in all its deteriorating glory. In the center of a large lake, is an eerie dragon in which you can wander around halls that are meant to look like the inside of the beast. There is graffiti, broken fish tanks, young Vietnamese hanging out in the various rooms, and enough space for you to explore the space on your own. I recommend bringing a camera. Although recent articles have encouraged more traffic to this abandoned park, it is still worth a visit. On the other side of Hai Van pass, 33 kilometers from Lang Co, you will find a very spooky national park. This is actually one of my favorite places that I have visited in Vietnam. It may have been due to the minimal amount of visitors I encountered while there, or the thick fog that rolled in and made for a very mysterious scene. Either way, if you have a weekend, I highly recommend spending some time exploring the many ruined villas, hidden shrines, and incredible hikes this park has to offer. First things first, you cannot enter the park with your motorbike. Park outside the visitor’s center, and then walk inside to purchase a ticket and minibus ride. You can definitely begin trekking (15 kilometers) from the visitor’s center to avoid the minibus fee, but if you have limited time, then gather your friends and people around you to front the 900,000 VND same-day return bus. If you want to spend more time here, then purchase the 1,300,000 VND ticket for next-day return. At this point, pull up your socks, cover all exposed skin, and get ready to encounter leaches. I definitely encountered a leach in the minibus which was a pleasant surprise. There are so many things to see in this park, make sure you fit in a hike, some old villa sightseeing, and look for the tunnels that were dug into the mountain. The minibus driver will have a few ideas on where to go but you should also do the proper research beforehand in order to know what you want to do. There is also a variety of interesting accommodations to choose from if you want to stay overnight. Please stay tuned for an in-depth guide that covers all things Bach Ma National Park! Pro tip: You can combine Bach Ma National Park and Hue into one weekend in order to truly explore this area. You may have heard of the grandeur of these caves but nothing compares to seeing them in person. Phong Nha-Ke Bang National Park and the surrounding caves offer a mystical experience as they house the largest cave in the world. 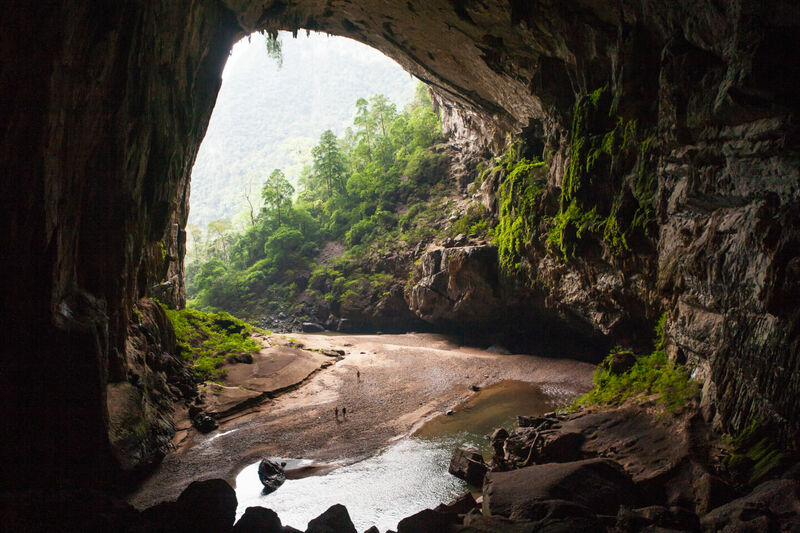 Phong Nha is about 300 kilometers from the heart of Da Nang, a 6-hour card ride, but if you want to swim through underground caves, trek the true wildness of Vietnam, then this is a rare experience that you should take advantage of before it changes. You could combine the experience with a stop in Hue in order to both experience the Imperial city and ancient buildings as well as untouched Vietnam. There are a few guiding companies that each lead small groups through different caves. The most established company is Oxalis and they provide tours from one to four days for varying athletic abilities. They even provide a tour to Hang En cave in which you get to sleep in the mouth of the behemoth natural wonder! I have only begun to detail the extensive traveling options starting just outside the Da Nang city limits. 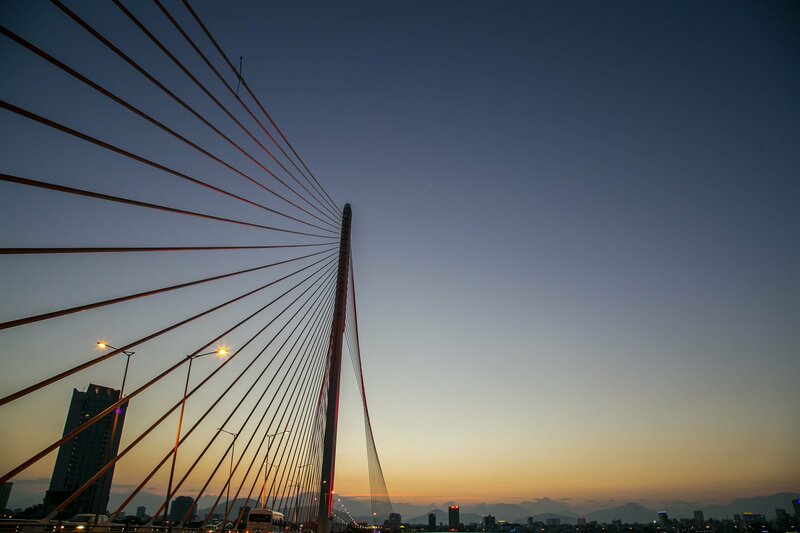 Da Nang is a wonderful city itself with all its color, liveliness, and friendly city-goers but it is also a central launching point for adventures you can find nowhere else in the world. I, myself, have chosen Da Nang as my home and every day I stare in awe at the wonders around me. Thanks you very much for your experience. I am Viet Namese, but i don’t know at all. It is very clear. Next time, i am going to Da Nang province with my family. I am going to Ba Na Hill, Son Tra Beach, Linh Ung Podag and Hoi An. We are going to eat some famous food of Da Nang, example sliced pork rolled rice paper, Quang noodle, seafood, Viet Namese pancake, Noodle soup, bla bla. I am going to have a great time!